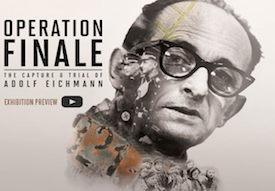 Louise Uzan introduces us to “Operation Finale: The Capture and Trial of Adolf Eichmann,” a traveling exhibit currently on display at the Holocaust Documentation and Education Center in Dania Beach through March 31, 2019. As one of Adolf Hitler’s deadliest top lieutenants and the “architect” behind the murder of millions, Eichmann was the face of one of the greatest crimes in history, and his capture transfixed the world. Israeli secret service agents got a tip in 1958 that Eichmann might be hiding out in Argentina. Two years later, a team of Israeli agents snatched him off Garibaldi Street not far from his home. Soon, he was on a plane to Tel Aviv, sedated and donning goggles taped over to block his vision. The 1961 trial was televised for the world to watch, giving many their first glimpse into the horrors that unfolded inside the Nazi death camps. The xhibit Operation Finale is a co-production of The Mossad, Israel Secret Intelligence Service, Beit Hatfutsot, the Museum of the Jewish People, Tel Aviv, Israel; and the Holocaust Documentation & Education Center.